It’s not at all difficult. What is it you want to know? You want me to explain it to you in a kind of formal logic fashion? Hmm… I suppose I could. It’s easier to do if you have visual aids. Alright, let me give a general summation: We all know that lines are named by where they go, yes? The road from Glasgow to Edinburgh. Point A to point B. And if you have many roads, you may have to be more specific: Route Interstate 5 from San Diego to Washington State. Let’s say that a simple, straight line could be named by two points. Line AB or Line TJ. You may have seen this in Geometry. But this isn’t terribly descriptive. No not at all. Interstate 5 may go from San Diego to Washington, but it meanders around quite a bit. It’s very wiggly. So instead of just naming a line AB, we name it more descriptively, with a “function”. You’ve seen f(x)? This just means there’s a car on the road tracking the wiggles and creating a mathematical sentence to describe the path of the road. A simple function or f(x) would be f(x) = 2x – 6, Which means, for every point you have…every “x” you will modify it in those ways to get the second coordinate in space. If we put in an 8 for x, we get 10. For x=8, the second coordinate or “y/ f(x)” is 10. “8,10″ And so by putting in a series of numbers we come out with a series of coordinates that create a rather good description of our line! We name the road by how we are tracking its progress. The function, f(x) is the name of the line. Why am I demonstrating such basic algebra, well…because sometimes people get so confused by nomenclature, that it all becomes a jumble of letters and numbers and it is confusing. Just always remember that f(x) is the description of the line, its name. Now what if you want to know the total area in miles that lies, oh lets say, on the western side of Interstate 5, from the road to the coastline. That’s an odd shape, right (pretend the coast is a flat line, for the purpose of the visual)? You want to know how much land lies to one side of the road, but with such an irregular shape, how are you going to figure out that area? It’s simple! You’re going to create a series of rectangles beneath that line and add them up! Rectangles are easy, right? Their area is just height multiplied by width! A rectangle 6 feet ling by 2 feet wide has an area of…12 feet! Now do this hundreds of times!, You will have a truly good approximation of the total area to one side of that road. Let me give you a visual! So in the above image, lets say that the road is called f(x). The line at the bottom (the x axis) is the California Coast, and the Line at the left (y axis) is the state line between Mexico and California. F(x) goes clear from Mexico to Canada, but we only want to know the land measurements from San Diego to Seattle, or…A to B. The line A and the line B are our bounds. The top boundary is the road, the bottom is the coastline, and we want to calculate all that is between, so we are going to make rectangles, BUT! The thinner our rectangles, the more accurate our assessment will be, because there will be less left over space. So how do we write this down? So, f(x) is just our road, our line. That long “S” shape there on the left is just saying “This is the integral” (or the space beneath the line), and the little a and b simply indicate between boundary A and boundary B! “dx”, stands for “delta” or “change” along the x axis…or…just means “little pieces of x”, like mile markers or segments between cities. Now obviously, this formula assumes you don’t know anything about anything and are making generalizations, like saying “all cars have four wheels”. Yes, thank you, but you’re not giving me specifics. I need specifics. So instead of just “insert line name here” we will insert the actual name of the line, the line’s function. And instead of the A and B, we will put in our actual boundaries. Yes, i borrowed this equation because I couldn’t think of one off the top of my head. Sue me. It’s been about 30 years since I last did this nonsense. So…On the line (3x^2 + 4x + 1) we want the area from boundary 1 to boundary 5 on the x axis, for all the “dx’s” along the x axis between 1 and 5. Now like there are in all things, there are rules for how we do maths. There’s the rules about the order in which we do things (order of operations) and so forth. And this is no exception. 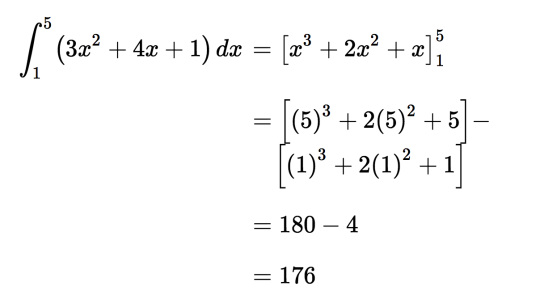 There’s the Integral Rule of Powers, which tells you how to get from the above equation to the next stage (In case you’re wondering, the integral rule of powers is that the exponent gets one added, while the integer is divided by that sum. 3x^2 becomes x^3. ), but I’m not teaching you how to calculate, I’m just giving you a visual idea of how this works. Calm down. The integral rule of powers simply converts our equation into the business on the top right there. Then we put in 5 for x and then 1 for x, and subtract. We made the line. We drew in all the little rectangles from mile marker 0 to mile marker 5, then we subtracted all the rectangles between 0 and 1, because we wanted to start from 1. In my first analogy Zero = Mexico, 1 = San Diego, and 5 = Seattle. We aren’t finding the area from Mexico to Seattle, but from San Diego to Seattle, so we just subtract all that business between Mexico and San Diego. Now the line determines the upper edge of the rectangles. Said another way, the name of the line becomes the dimension by which we calculate how tall our rectangles will be, and so the line must be used as one of the length/height requirements. So our rectangle width is “Some distance along x” and our height increment is “However tall that line is at that point”. So really, all you’re doing is fancy addition. Adding easily calculated shapes together and averaging a bit, to get the area of an odd, curvy shape. Now…things get complicated if we want to find volume, but you didnt ask me that. Well, friends, a line isn’t just a line. A road, isn’t just a road. What if the road was through space and time? What if the “area under it” was actually something incredibly complicated. It’s a poem. An integral is a way of approximating a truly complicated reality in a way that makes it visually accessible. That’s all. If that doesn’t clarify…I am sorry to say I am not a magician. Just a humble monster. This is to make the concepts make sense, so that you…eh…for lack of a better term “Grok” it fully. I’m just trying to demystify, so that you see words and sentences instead of jumbles of characters and numbers that terrify with the promise of hours counting on any appendages you can muster. This is why Simone is awesome. 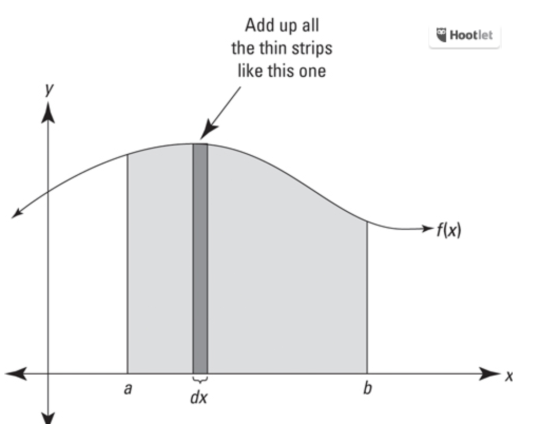 And, yes, as a senior engineering student that had calculus shoved down my throat till I breathed the stuff…. f (x) is the road, the squiggle is the space underneath the road, the numbers on the squiggle (or letters) represent how far you go on the road, and the little dx at the end is the car. By the time you solve it, you now know how much gas your car just used.